The leading global Internet brand, Yahoo has recently announced the launch of an early beta version of its all-new Yahoo! Go 3.0 at Consumer Electronics Show (CES) 2008. 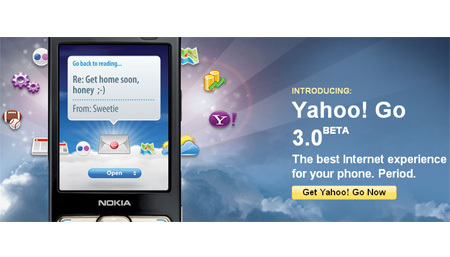 It’s the Yahoo!’s flagship all-in-one mobile offering which includes an upgraded and feature-rich user interface thanks to the feedback from Yahoo! Go 2.0’s users, aiming to enhance your mobile Internet experience. For now, US consumers can download the Yahoo! Go 3.0 BETA version on over 30 mobile devices at get.go.yahoo.com, and the new version is expected to be available worldwide later this year.